Over the last four years, Bumble has conquering dating, friendship, and business networking. Now the buzzy company has set its sights on a new arena: startup investments. Bumble Fund is a new venture focused on early-stage investments for female-founded and female-led businesses. The fund will invest amounts ranging from $5,000 to $250,000 in companies that primarily serve women and are spearheaded by female leaders from diverse backgrounds. Bumble has committed more than $1 million to the fund so far. Two of the initiative’s early investments are in other women-focused funds, Kunst's Cleo Capital and Female Founders Fund. 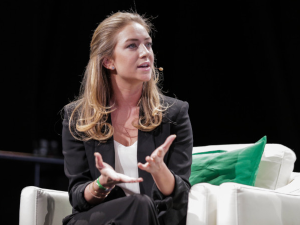 Bumble Fund has also backed Sofia Los Angeles, a swimwear company that was amongst the winners of Bumble’s first “Bizz Pitch” competition in the spring, as well as prenatal and postpartum healthcare company Mahmee and the beauty festival startup BeautyCon. Bumble declined to share the amounts invested in each of these companies, but noted that the fund’s mission is bigger than money. Bumble took a similarly mission-driven approach when announcing Bumble Fund. In a blog post, the company revealed that startups headed by women only received 2% of all venture capital last year. Bumble says it wants to help solve the problem of women being “largely ignored by the venture capital establishment” with this fund. Going forward, the company hopes to discover investment opportunities through a mix of expert advice and its own platform. Jones Simmer says the company plans to use the professional networking tool within its app, Bumble Bizz, to identify potential fund recipients. Future Bumble Bizz pitch competitions are also in the works. For more info on this dating service, check out our Bumble app review.